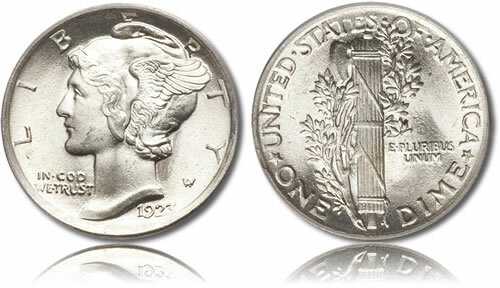 The Mercury Silver Dime, also known as the Winged Liberty Head Dime, was struck by the United States Mint from 1916-1945 with a composition of 90% silver. Each dime contains .07234 ounces of the precious metal. Collectors know this coin by two different names owing to a misunderstanding of the design. When first released, many mistook the image of Lady Liberty wearing a Phrygian hat to be an image of the roman messenger god Mercury. As such, they started calling it the Mercury Silver Dime and the name stuck. Millions of the Mercury Silver Dimes were produced over the three decades in which they were produced. Despite those large numbers, it is not uncommon for near-perfect examples of these dimes to command thousands of dollars. Both the obverse and reverse of the Mercury Silver Dime were designed by Adolph A. Weinman whose name is familiar to most collectors. He was also responsible for the designs found on the 1916-1947 Walking Liberty Half Dollar. Together, the two coins are considered to be among the most attractive ever struck by the United States Mint. The obverse shows a portrait of the mythical figure of Liberty wearing a Phrygian cap which was long used to symbolize liberty and freedom. Wings were added to the hat to symbolize freedom of thought which led to the image being mistaken for that of the roman god Mercury. Surrounding the portrait are the inscriptions of LIBERTY, IN GOD WE TRUST and the year of minting. The reverse of the Mercury Silver Dime shows a fasces (a bundle of wooden sticks with an ax-blade protruding from it) entwined with an olive branch. It was meant to symbolize America’s readiness for war, but its desire for peace. Surrounding the design are the inscriptions of UNITED STATES OF AMERICA, E PLURIBUS UNUM and ONE DIME. The mintmark, when used, is present on the reverse. Copyright © 2011 CoinNews Media Group LLC. All data and information provided on this site is for informational purposes only. CoinNews makes no representations as to accuracy, completeness, correctness, suitability, or validity of any information on this site and will not be liable for any errors, omissions, or delays in this information or any losses, injuries, or damages arising from its display or use. All information is provided on an as-is basis.